Kids learn best when they are having fun. No surprise or secret here. One innovative approach in Victoria, BC, Canada was a project to encourage more kids to listen to French. On the West Coast of Canada the chance of hearing French is pretty slim or rare. However, being the second official language in Canada, it’s important to encourage young students to study and speak French as well as English. 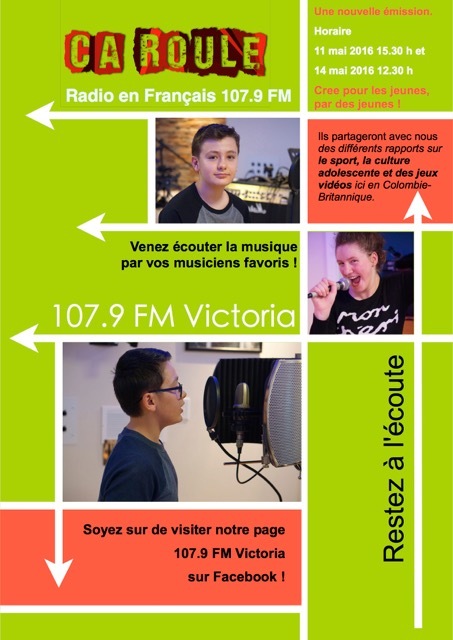 A group of Grade 7 students were challenged to develop their own teen radio show – in French! The goal was to encourage more kids in Victoria, BC, Canada to listen and speak French. This was an exciting project that commenced with brainstorming sessions with the Radio station Director and producers to come up with the name, format and content. Once the name, Ca Roule!, was agreed upon, the students selected topics that were of strong interest to them. It would mean they would be able to speak passionately about the subjects. They choose Video Games (what teen doesn’t like playing those! ), Sport, Music, Cooking and Books. In addition, to writing their scripts, seeking out people to interview they also were able to select French music to be played live on air. They had great fun seeking our both Canadian French and French artists online to share. They found an older student who served as their MC to glue each section together. Best of all, they found you could buy online, soundbites that added an extra bling to the overall production of the show. Finally, one of the students’ fathers, was able to compose a signature tune for their unique production. Indeed, he helped the students with the major editing and production of the final program. A job that would be challenging for most! The show was a success with many local schools in Victoria tuning in to listen, or downloading the show for sharing later with their students. Local press also enjoyed learning about this ambitious project – see here. All their hard word paid off, as they were invited to make four pilot shows that were aired live during the summer months. The show now exists online for anyone to download to listen. The project is now being extended to High School students to continue the format. This idea can be expanded for any topic. Consider getting your students to be “junior reporters” and write their dream interview. You could always video and host on a private “YouYube” post! Please share your creative ideas on getting kids to read and write more! Listen & discover #CaRoule podcasts, anytime via (Link to be added).